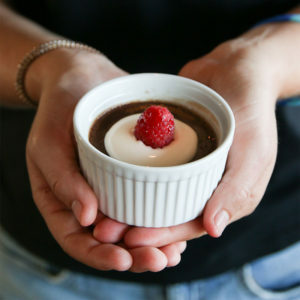 This easy chocolate bread pudding takes me back to my childhood in Honolulu. I start with King's Bakery Hawaiian bread, also known as Portuguese sweet bread, then layer it with chocolate chips and creamy egg custard. It bakes up to a glorious puffed pillow of chocolatey goo. It takes all of 15 minutes in preparation time. When I want to wow and don't have a lot of time, this is my go to recipe. Thank you to our amazing videographer Eric Michael Otten! I prefer to use the original King's round loaf and slice it. King's has now come out with an array of different sweet breads including a regular sliced loaf, hot dog buns, and rolls. They all work as they are the same type of bread, just in different shapes and sizes. So if you can't find a round loaf, feel free to substitute any of their other bread products. 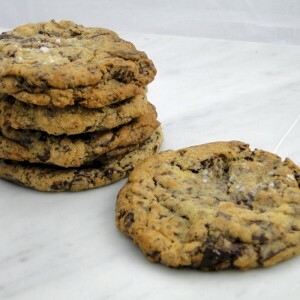 The quality of your chocolate chips makes a big difference in this recipe. I use Guittard or Ghirardelli. I like to bake this bread pudding in a round Spanish cazuela earthenware dish, because the pudding comes out looking like an enormous round puffy chocolate chip cookie. You can also use a 13 x 9 x 2" glass or ceramic baking pan. If you have the time, prepare the pudding without baking it up to one day in advance so the bread really soaks up the custard. 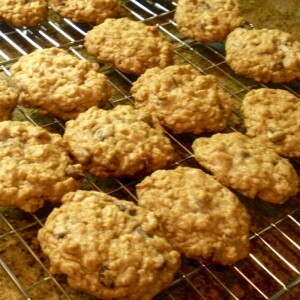 If you don't have the time to prepare it in advance, you can bake it right away without letting it sit. 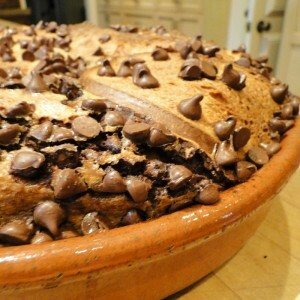 I originally created this recipe for my friend Carol who described to me a chocolate bread pudding she had eaten in NYC. How long do you cook bread pudding? I estimate between 1 hour and 15 minutes and 1 hour and 30 minutes. Cooking time depends on a variety of factors including the accuracy of your oven, how often you open the oven and the type of pan you use. I check the pudding by slicing into the center of it at about an hour and then check it every 10 minutes until the center is not runny when you slice it to it. Don't worry about the slice, it will magically knit back together as the pudding cooks. Oozing chocolate and creamy custard, this easy chocolate bread pudding will win you new friends. Heat oven to 300 degrees. Whisk together first 6 ingredients. Set aside. Butter a baking dish. Arrange half the bread slices in the bottom of the baking dish so they cover the bottom of the pan. Don't worry about the size or shape of the bread slices, just make sure the slices cover the the pan. Sprinkle with half the chocolate chips. Cover with a second layer of bread slices and chocolate chips. Crack the eggs into a large mixing bowl and lightly beat to incorporate yolks and whites. Add cream, milk, sugar, vanilla and cinnamon. Beat briefly just to combine ingredients. Don't over mix. Pour egg and cream mixture slowly over the bread. Pour slowly so the bread is able to absorb all the egg mixture. If you pour too fast it will overflow. If you are going to let the pudding soak for a few hours or over night, cover with saran wrap and press gently to ensure all the bread is moistened. Otherwise you can bake immediately. Cook an hour and 15 minutes. Check after one hour by inserting a knife in the middle. If it is runny, it is not done. Check every 10 minutes after the first hour. You don't want to over cook, but it may take as long as 1 1/2 hours to cook. When the pudding is no longer runny remove from the oven and let set 30 minutes before slicing. You can keep the pudding fairly hot for a while by covering it with foil. Loved the Bread Pudding. Thank you for sharing with all of us! Thank you Ronda. I am so glad you enjoyed it! I’m a big bread pudding fan (thanks to a New Orleans visit) and this recipe is the best I’ve ever had. I’m kinda of addicted now! Hi Claudine, I am so glad you liked it. This has been a long-standing favorite in my family. When my kids were living at home I would make one or two of these whenever we had their friends over. The baking pans were always licked clean! Looks tasty! Was wondering if it is supposed to be served hot or cold? And does it store well or best served right away? Ive never had bread pudding before, so not sure how to serve! This bread pudding needs to rest about 30 minutes after it comes out of the oven. You can cover it with some foil and it will stay fairly hot for an hour or two, but it is not bad at room temperature. I prefer it hot, or at least warm, but I will admit to eating leftovers cold the next day. So you have a lot of leeway with this recipe when it comes to temperature. Good luck and let us know what you think! What an interesting question. I have not tried making bread pudding in a crockpot, but think it is something I now need to try. There are multiple slow cooker bread pudding recipes on the internet. I think you may need to adjust the bread to liquid ratio and perhaps adjust the volume depending on the size of the slow cooker. Here is a raisin bread pudding I found on Allrecipes that has very good reviews. http://allrecipes.com/recipe/bread-pudding-in-the-slow-cooker/. I’d love to hear back from you if you try my recipe in the slow cooker. Is the cream in recipe “heavy whipping cream?” I’ve never made bread pudding and am looking forward to attempting this recipe! It looks and sounds so yummy!! Whipping cream or heavy cream both work well for this recipe. I hope you enjoy it! I use a 12″ ceramic cazuela or a 13 x 9 x 2″ baking pan. I hope you enjoyt the bread pudding! thanks for this great recipe. i needed something chocolate to go with my other Thanksgiving desserts and this was it. followed the recipe exactly and let soak overnight and this was fabulous. sweet and luxurious but not too sweet. Absolutely use the Guittard chocolate as recommended. So glad you enjoyed the Hawaiian Chocolate Bread pudding Lisa. Can’t wait to try this for a potluck dinner next week. Have you ever tried it with pecans baked on top? Wondering how that would taste. Hi Sharon, I have added nuts and tucked banana slices into the layers. You can’t go wrong! Let us know how it turns out! Hi there! Can you substitute coconut milk for plain milk in the recipe? Hi Amanda, This is a great question. I have not used coconut milk in a bread pudding before, but it is on my to-do list now. I have done a little research and there are plenty of bread pudding recipes that use coconut milk instead of real milk. My only suggestion is that you do not use light coconut milk. Please let us know how it works out! Unfortunately in Canada we cannot get the Hawaiian Sweet Bread. What may I substitute this with? Hi Mary, You can use challah bread, brioche or Portuguese sweet bread. I have used Bahamian bread when I am in the Bahamas. Ideally, you will use a bread that is light and slightly sweet. There is a brand called “President’s Choice” Hawaiian Sweet Buns that I believe is made in Canada that should also work. You can use the buns instead of a regular loaf of bread, which I have done in a pinch. King’s Hawaiian bread does have pretty amazing distribution and you may be surprised to find it in Canada in places you might now expect, like Walmart. I have found it in out-of-the-way places like The Abacos in the Bahamas.